HyperX wants to appeal a little more to the consumer side of gamers. The company has taken the wraps off of the new HyperX Cloud Mix headphones, aimed at offering gamers a headset they can use in the game, and anytime else they may want a pair of headphones. But is HyperX successful in delivering an experience that translates between both gaming and everyday life? We put the HyperX Cloud Mix headset to the test to find out. The first thing you’ll notice about the HyperX Cloud Mix is that it looks like a HyperX headset — but with a few major changes. In particular, it features many similar design elements to the HyperX Cloud Alpha, albeit without the red color accents. We think that’s a good thing for a headset HyperX wants you to take out and about with you. On each ear cup, you’ll find the HyperX logo in silver, along with a few different controls on each one. On the left ear cup, you’ll get an aux port and microphone jack, as well as a multi-control button, which is used to play and pause music, and take phone calls. On the right ear cup, you’ll get a volume rocker, as well as a power button and a MicroUSB port. We’re a little disappointed to find MicroUSB on this headset. It’s 2018, and the industry is moving to USB-C, so releasing a device with MicroUSB instantly dates it. Apart from the MicroUSB port, the headset is pretty sleek and stylish. It’s clearly got a ton of padding in the ear cups and on the headband, and a strong metal frame holding everything together. There is a solid amount of plastic in the design of the headphones, but it’s strong while still being relatively light, which is always helpful. The cabling is very strong too — it’s protected with a braided nylon, and we don’t think it’ll break any time soon. Design-wise, this is definitely a headset you could use in a range of situations. It is an over-ear pair of headphones — and as such they’re a little too chunky to be truly portable. That doesn’t mean they’re not good for day-to-day use though — we think they’re particularly good for use around the house, for example. In the box, apart from the headphones themselves, you’ll get a removable microphone, audio/microphone cable splitter, MicroUSB charging cable, and main cable with a small remote that allows you to quickly mute the microphone when needed. There’s also a carry bag, which is a nice inclusion — especially for a pair of headphones that are supposed to be portable. HyperX is no stranger to building comfortable headphones, and the HyperX Cloud Mix headphones are no exception to that rule. As mentioned, there’s plenty of padding in both the ear cups and the headband — which helps make it easy to wear the headphones for hours on end with no issue. As gaming headphones, they’re not quite as comfortable on the top of the head as the likes of the SteelSeries Arctis series, but they’re still very easy to wear for extended periods of time. That’s true for both gaming use and day to day use — really the only situation in which these headphones would not be appropriate is at the gym or while running. Ultimately, the most important thing to consider is how the headphones sound — and they need to sound good for a range of different situations too. Do they live up to that? Thankfully so — but they’re not perfect. Let’s start with the bass, which is generally powerful and deep. For gamers, that’s good for giving things like explosions a little extra oomph, while music-lovers will enjoy the extra in power that you get in kick drums. The mid range is well-tuned too. The low mids are nice and warm, while the high mids seem to have gotten a slight dip — helping give the headphones a modern feel to them. Thankfully, that dip isn’t too over the top — vocals are still able to cut through a mix nicely, for example. The high end really sounds quite good on this headset. Cymbals are given a nice shimmer during music listening, while details like footsteps sound nice and crisp while gaming. The lower highs do seem to have some of the dip you get in the high mids, but in general we enjoyed the amount of clarity and detail on offer by the HyperX Cloud Mix. Part of that has to do with the fact that the headset is certified for hi-res audio — which is great for audiophiles that want a detailed sound. So is the headset a solid choice for gaming and day-to-day use alike? Well, yes. The Hyper X Cloud Mix sounded great in all the tests we put it through, which is great news for those that want something versatile. The HyperX Cloud Mix is HyperX’s first Bluetooth-connected headset, and it’ll connect to your listening device through Bluetooth 4.2. As such, you’ll get a listening range of 33 feet, or up to 10 meters — and we found that they were good at retaining connectivity without too many jumps or skips during playback. When it comes to battery life, you’ll get 20 hours — which is actually quite good. On top of that, you’ll likely use the headset in wired mode when gaming, meaning you’ll get much more than 20 hours of use out on one charge — and you can charge the headset while you’re using it, which will top of the battery. We think 20 hours is more than enough for most people interested in buying the HyperX Cloud Mix. HyperX has hit a home run with the HyperX Cloud Mix headset. 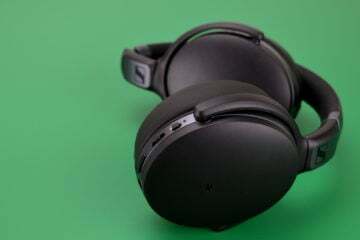 The headset is comfortable, well-designed, and sounds great, making it an excellent option for gamers that want a headset they can use in daily life too. There is a problem though — and that’s price. The headset comes in at a cool $200, which isn’t cheap. Safe to say, if you’re really only looking for a great gaming headset, then perhaps you’re better off going for something like the SteelSeries Arctis 7, which is $40 cheaper and one of our favorite gaming headsets. Or, maybe you want something that’s mostly for day-to-day use, in which case something like the Sennheiser HD 4.40 BT, which comes in at $150, might be a better option. If, however, you want something that works great as both a gaming headset and a daily user, then the HyperX Cloud Mix is an excellent option. That’s why we’ve decided to award the headset the Headphone Review Silver Medal.